Each year my mom visits my grandpa in Arizona, and comes home with bags of delicious dates! My grandpa lives in Yuma, and there are about a million date farms within a few miles of his house. We've tried lots of different ways to eat dates... date shakes, date cookies, they're even awesome plain. I think this is my favorite way to eat them yet, though! 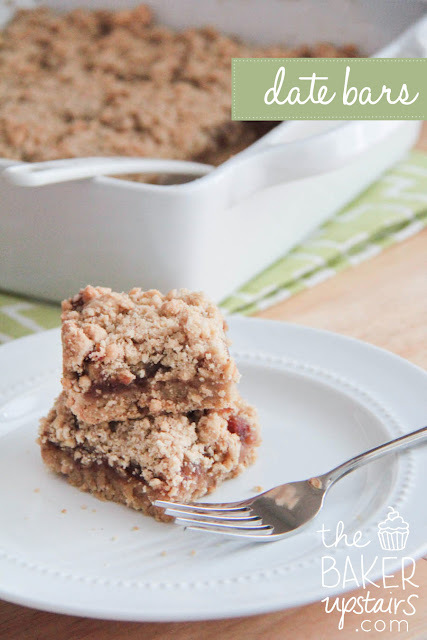 I love the crumbly, cinnamony crust/topping, and the date filling is sweet and delicious. If you don't happen to have access to a date farm near you, I've seen dates at Costco, and even the produce section of the grocery store. Make these, and you won't be disappointed! Preheat oven to 325F. Line a 9 x 9 pan with foil, and spray lightly with cooking spray (this makes it easier to lift the bars out). Place the dates in a small food processor or blender. Pour boiling water over the top and pulse until a rough paste forms. In a medium bowl, mix together the flour, baking powder, salt, sugar, and cinnamon. Cut in the butter until the mixture resembles coarse crumbs. Mix in beaten egg to form a moist but crumbly dough. Press 2/3 of the dough into the prepared baking dish. Spread the date mixture over the top, and crumble remaining dough over the date mixture. Bake for 30 minutes, or until the top is lightly browned. Cool before serving.